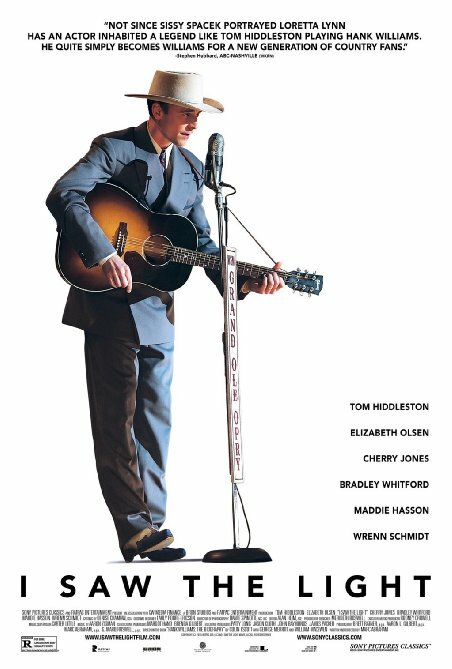 RYAN: This is the new Hank Williams biopic starring Tom Hiddleston, most popularly known as Loki from Thor and The Avengers. Elizabeth Olsen costars and I was really looking forward to this because these biopics tend to be very good and are usually Oscar bait. And I love Tom. I was hoping this would be similarly entrapping like Walk the Line. TINA: I didn’t see that one. I did see Ricki and the Flash with Meryl Streep though. RYAN: (laughs) That wasn’t based on a true story though. That was still more interesting. For a two hour movie, this was only really dramatic or interesting in two moments and the rest of the time I was really bored. TINA: Yeah. The dialogue was boring. I didn’t want to walk out, though, because I was waiting for something to happen. You really expect there to be action of some sort. RYAN: And it wasn’t even that good! TINA: (laughs) It wasn’t that good. And what bothered me was that there were so many times I didn’t really know what was going on. TINA: There was a scene where you asked me if they were getting divorced and neither of us could figure it out. RYAN: I appreciate any movie that doesn’t want to hit the audience over the head with info – and leaves room to infer – however, a film based on actual events, or a real person, should not be that kind of movie. This isn’t sci fi or thriller – there’s no mystery or intrigue. And yet we were often at a complete loss for the facts of his life. It did a good job hinting at what was going on, but it was never explicit, and so it resulted in feeling like nothing was going on – and yet, clearly, there was a ton! So this was a mess. TINA: I never knew what was going on. It was really annoying being confused. RYAN: It was confusing – you didn’t know anything for sure. And if we went in as previous fans of his work, or aware of his life story, it might be all very creative to unfold this way – but I walked in knowing nothing about the man or the artist. I recognized a couple songs, of course, but the story was new to me, so I didn’t appreciate the lack of straightforwardness. Nothing was explicit. TINA: I didn’t know anything about him either. It was long and slow moving. RYAN: I love Tom Hiddleston. Loved him in Crimson Peak. Love him as Loki. And he’s incredible in this movie – did all of his own singing. But I’m sorry. He looks 35. Ne never looks like he’s in his 20s for a moment. TINA: And the movie never really showed how successful he was. He always still seemed poor. He plays the Opry but aside from that, you don’t really get a sense of his success. I grew up in Germany and never even heard of Hank Williams. RYAN: I was familiar with his name and some songs but didn’t know anything about him. Elizabeth was good and Cherry Jones as his mom was also nice to see. TINA: They were good. It’s forgettable – after an hour, you’ll forget about it and never think about it again. RYAN: It’s disappointing. With more drama, it could have been great. I would have turned it off at home.